Worst Line Extension Name Ever? Betty Crocker Lotion. Need I say more? This product is insane on two levels. First of all, the person at General Mills who allowed a license to use the Betty Crocker name on a lotion product should be fired. Why would you risk the damage to a great brand name that has been used since 1921 in products that create “…convenient, delicious meals and easy-to-make, great-tasting desserts” (from the General Mills website)? Second, the company that licensed the name Betty Crocker for use on a lotion should be forced to sit through a week of focus groups with American women evaluating this idea. I can assure you that the result of every focus group will be a brutal assessment that will be quite painful to watch. Sometimes name development produces brand names that are subject to interpretation, but in this case, the name is so bad that the results can be predicted with near certainty. Betty Crocker Lotion is being sold in dollar stores most likely as a way to get rid of excess product that did not sell at retail. One of the websites I read regularly had this article about “How The Clouds Got Their Names.” Fascinating. Check it out! I’m a big fan of naming hurricanes. A hurricane is a large and significant weather system that can cause a huge loss of life and money. Naming a hurricane can provide a shortcut that leads to better communication about the danger. And besides, we humans like to have a “person” to blame. There aren’t many people in New Orleans who can say the name Katrina without cringing. I’m not a fan of naming winter storms. The Weather Channel started naming winter storms three years ago because they felt that “…naming the storms will result in clearer communication about the systems.” Or maybe will increase ratings. Or gain sponsorships. I’m not sure which is the right reason, but I don’t like the idea of naming a snowstorm. It’s just a snowstorm already! Thanks Weather Channel. Is this a secret message to weather-weary Northeasterners to “MOVE SOUTH?” By the time we get to Y we will be on the 25th winter storm. I know that YOLO will definitely reinforce that message in my brain! With all due respect to Mr. Wonder, when it comes to branding, superstition may actually be the way in certain cases. Allow me to explain. About 20 million Americans suffer from paraskevidekatriaphobia, or fear of Friday the Thirteenth. Before you scoff at this phobia, recognize that the American economy loses an estimated $800 to $900 million from reduced economic activity every Friday the Thirteenth (according to the Stress Management Center and Phobia Institute of North Carolina). People who suffer from the fear of Friday the Thirteenth stay home or cancel trips on that day. Or maybe you have heard of hexakosioihexekontahexaphobia (fear of the number 666 aka “the mark of the beast”)? The folks at Zillow.com examined real estate sale of homes with “666” in the list price, and found that those houses sold for 3.2% less than other similar homes (Zillow’s home page is http://zillow.com). 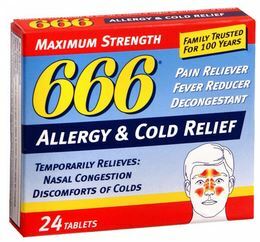 However, that phobia did not stop the makers of 666 Cough and Cold Products from branding their products with it (I guess for when you have the devil of a cold?). The number 7 is thought to be a lucky number, and some brands have embraced it. 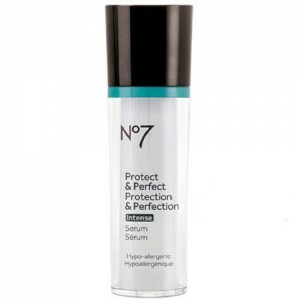 For example, Boots calls its skin care line No7 because the number seven was, at one time, used to denote perfection. “7 for all mankind” is a high fashion denim clothier whose jeans (nicknamed “sevens”) have “…graced the bodies of notable female celebrities that include Emma Stone, Kim Kardashian, Jennifer Lawrence, Kristen Stewart, Jessica Alba, and Kate Bosworth” according to their website. There are many more examples of “7” brands. Sometimes marketers can make a major error in branding if they are not aware of the superstitions of their target consumers. For example, if you are selling a product in an area of the US where there are significant numbers of Chinese-Americans, you may be aware of the “lucky” connotations of using the number “8,” which is pronounced “bā” in Mandarin and sounds very similar to the Mandarin word for “prosper” or “wealth.” However, you should probably avoid use of the number “4” which is considered unlucky because it is pronounced similarly to a word that means “death.” As proof, Zillow.com calculates that in areas where the Chinese population is great than ten percent, homes with a “4” in the list price garner sales prices that are 1% lower versus the estimated sales price, while having an “8” in the list price translates to an increase of 1.5% versus the estimated sales price. Does superstition matter? Apparently it does to some people. And if those people happen to be in your target market, then you should probably pay attention to it! 1. People Can’t Pronounce or Spell Your Name – Here are a few of the names chosen by startup companies last year: Zairge; Xwerks; Synthorx. If no one can pronounce or spell your name how do you expect people to remember it? 3. Your Name Is Generic Or Descriptive – If your product is called “Fast Chop” because “fast chopping” is the main benefit of your product, you may think you have a great name. But if your competitive set consists of products called EZ Chop, Speed Chop, QuickChop, and TurboChop then nobody is going to notice it. Advertising will be wasted because even if consumers think “Fast Chop” is great when they get to the shelf they will be confused by all the similar names and products. If your name does not stand out versus your competition you had better change it. 4. You Have A New Target Or Strategy That Won’t Fit Your Current Name – Speaking at Macworld Expo in 2007, Apple CEO Steve Jobs announced that Apple was dropping the word “Computer” from its name. “The Mac, iPod, Apple TV and iPhone. Only one of those is a computer. So we’re changing the name,” said Jobs. Today, Apple is a powerhouse of consumer electronics and is a great example of why a strategy change should drive a name change! 5. Your Name And Current Brand Identity/Execution Clash – In 2003 the world’s largest tobacco company, Philip Morris, officially changed its name to Altria Group. While some considered this a PR maneuver to distance the company from its tobacco heritage, CEO Louis Camilleri said that the name change was “an important milestone” in the evolution of the company. “It doesn’t signify an end or a beginning,” he said. “Rather, it marks how far we have come and gives us a framework for how much further we aim to go.” The sleek and modern Altria Group has been a star performer in the stock market since this name change. 6. You Are Ready To Enter The Big Leagues – Larry Page and Sergey Brin started a search engine called BackRub. A year later they changed the name to Google, which reflected their mission to organize a seemingly infinite amount of information on the web. Blue Ribbon Sports was founded on January 25, 1964. The company, started by Bill Bowerman and Phil Knight, officially became Nike, Inc. on May 30, 1971. Sometimes the name you start with is not one you want to use when raising money from the investment community! 7. You Can Add A Relevant Benefit To Aid Recall & Persuasion – Diet Deluxe was the name for a new frozen entree company which was renamed Healthy Choice to add a benefit to the product name. Sound of Music operated nine stores throughout Minnesota in 1978. After a tornado hit their largest store, the owner decided to have a “Tornado Sale” of damaged and excess stock in the damaged store’s parking lot promising “best buys” on everything. After Sound of Music made more money during the four-day sale than it did in a typical month, the company was renamed Best Buy. Is there a relevant benefit in your name? Should there be? 8. Your Current Name Is An Ego Trip – The biggest factor in selling or gaining an investment in your business is the degree to which the business can operate without you. If your name is the business name, then growth and investment will be limited. Subway started out as “Pete’s Super Submarines” in Bridgeport, Connecticut. Do you think that Subway would have grown as fast if it were still called Pete’s Super Submarines? 10. Your Name Is Not Likeable – What is the “Acid Test” response? If you expose the name to your target customer and she smiles when she hears it or says, “That’s a great name!” without thinking about it, then you may have a winner on your hands. On the other hand, if she has a puzzled look or a negative reaction, you might want to consider a change. I also count “polite indifference” as a failure. If people have no reaction, then they are probably too polite to tell you how bad it is. And please do not expose the name only to friends and family. These people are programmed to be nice to you and so you won’t get honest feedback. If your name does not bring a smile to your customer’s face, then maybe you should change it. Of course, each situation is unique and there are always costs to changing a name that should be considered. Are there other situations where changing a name can be a good idea? I’m often hired for name development by entrepreneurs who are starting a business. However, many founders take the “do-it-yourself” approach to name development. Sometimes that works for them, but all too often they make a horrible mistake that is easily preventable. My basis for this conclusion? I defy you to guess what the business is selling. Go ahead…try…I’ll wait. Can’t do it? I’m not surprised. You won’t get a clue from the name, and unless you already know about these companies you are taking a wild guess. I’m not picking on these companies for their names because there are many others with similarly confusing names. For the record, Zairge (zairge.com) is a mobile property management system that simplifies and accelerates productivity for the owner, employee and guest. Xwerks (xwerks.com) offers elite nutrition for elite athletes. Synthorx (synthorx.com) is a biotechnology company using synthetic biology to synthesize solutions. While I have no information about how the names for these companies were developed, I strongly suspect they may have fallen into the “.com conundrum.” Many startup companies I work with insist on having a one word name with one or two syllables that has a .com website available. That virtually guarantees the use of nonsensical clusters of letters that result in a name without relevance. Letting the availability of a .com domain drive your name selection is a huge branding mistake. These three have nice, short, memorable names. They are common words that are easy to pronounce, read and spell. Beep is a startup that sells a device that facilitates synchronized music in every room. Shout builds marketplaces for passionate people. Swish offers mobile payment solutions. In each of these cases, the company has chosen a relevant name that builds a brand around the benefits that their product offers. But because they chose a common word they don’t have the “exact word” .com address. So which is better: Having a simple, easy-to-pronounce name that has meaning, or having a name that gets you a one word .com address? My 25+ years of branding experience tells me that a name that has meaning is infinitely more important than a name chosen because you can get a single word .com address. You can ALWAYS get a .com address that makes sense. The websites for Beep, Shout and Swish are: are www.thisisbeep.com, http://useshout.com, and http://swishme.com. The companies have found a clever way to get a meaningful name AND a relevant website. You can do the same. Add “my” or “the” to the front of your name or add “online” or “world” to the end of it. If you need other ideas give me a shout and I’ll help. But please don’t pick a name that looks like a random selection from alphabet soup just because you can get a .com domain. You will only create confusion and that is never a good thing. ARE CRAFT BREWERS RUNNING OUT OF NAMES? Of course this is utter nonsense. Brewers will always be able to find unique names. They just may not be able to use the names that are top of mind. It won’t be easy. Hint, hire some professional help! Here is a novel idea…why not develop a strategic naming approach that leverages the brewery and develops a family approach to name development? As an example, look at the Russian River Microbrewer. As of today they have 21 beers on tap. The names include Pliny The Elder, Row 2, Hill 56, Blind Pig I.P.A. and Dribble Belt. In short, it looks like they are pulling names out of a hat. There is no consistent approach to naming. The end result is a trademark attorney’s delight because eventually they will hit a conflict (and may not know it). But if they took a strategic approach to naming they could do two important things. First of all, they would build a brand. Second, they could put a stake in the ground that protects their names. Are craft brewers running out of names? Nah. Will craft brewers have to work harder to get beer names that will pass trademark scrutiny? You betcha. I look forward to helping a few develop great names (and BTW, I’m open to a barter arrangement!). Johnnie Cochran, O. J. Simpson’s attorney for his murder trial, used that famous rhyme to drive home a message point. Would it have had the same impact if he had said “If it doesn’t fit then you must find my client to be not guilty?” I doubt it. Like him or not, Johnnie Cochran was a master communicator and he understood the power of rhymes. Brand names and slogans that rhyme are much more memorable and enable easy spread of messaging. Dubble Bubble, Mello Yello, Laffy Taffy, Reese’s Pieces, Piggly Wiggly, YouTube, and many more brands use the rhyming technique. I think you would agree that once you hear a rhyming name it is relatively easy to remember it. A rhyming name can lead to fame. Daniel T. Willingham, Professor of Psychology at the University of Virginia, has studied numerous ways to improve education through application of cognitive science. In his article “What Will Improve a Student’s Memory?1” he discusses the use of mnemonics such as rhyming as a means of improving a student’s retention of material. Think of mnemonics as “retention shortcuts.” A mnemonic such as rhyming may be particularly powerful because it adds acoustic encoding to your branding, which is already being interpreted in a visual way, thereby enhancing storage in your brain. Mnemonics such as rhyming have been proven to enhance learning in multiple studies (here is one2). And be honest, who has not used a rhyming mnemonic is the past? Quick question: what year did Columbus discover America? I bet some of you used the “in fourteen hundred and ninety-two Columbus sailed the ocean blue” rhyming mnemonic to answer the question! There is scientific evidence3 that provides some rationale as to why rhyming generates such positive effects. Matthew McGlone and Jessica Tofighbakhsh used rhyming proverbs such as “Birds of a feather flock together” to assess whether people considered aphorisms that rhyme to be more accurate than those that do not rhyme. The results concluded that “Extant rhyming aphorisms in their original form (e.g., “What sobriety conceals, alcohol reveals”) were judged to be more accurate than modified versions that did not preserve rhyme (“What sobriety conceals, alcohol unmasks”).” They concluded that the results “…suggest that rhyme, like repetition, affords statements an enhancement in processing fluency that can be misattributed to heightened conviction about their truthfulness.” In other words, rhyming generates processing fluency which can cause people to judge messaging as being more accurate. How can you use this to your advantage? Obviously if you have the opportunity to rhyme you should consider it strongly. But don’t strive for rhymes just for the sake of rhymes. Consider using a rhyme to link a key benefit to your name, thereby generating name memorability and key benefit memorability at the same time. As an example, consider the name StubHub. StubHub is an online marketplace owned by eBay, which provides services for buyers and sellers of tickets for sports, concerts, theater and other live entertainment events. If you are looking to buy or sell that “hard to find” ticket in a sold-out arena, chances are you can do it on StubHub. The StubHub name is a great demonstration of a powerful use of rhyming in branding, as the name helps communicate that the site is a central hub for people who want to buy or sell tickets. 7 – Eleven is another great example of a rhyming brand name with relevance. When the company launched, the name represented the hours of operation of the stores (now many of them are open 24 hours). The hours were a key marketing message for the brand at the time. The Crunch ‘n Munch brand name combines the “crunching” benefit with the “munching” eating occasion to create a powerful, memorable name. The next time you have the munchies and want something crunchy, I guarantee you that Crunch ‘n Munch is going to be top of mind! Lean Cuisine is a brand of frozen entreés which were introduced as low-fat, low-calorie versions of Stouffer’s products. The Lean Cuisine brand helped create the category of healthy frozen entreés and today it is a global powerhouse brand owned by Nestle. I can assure you that the rhyming name that exhibited a dual benefit of “Lean” (= healthier) and “Cuisine” (= great tasting) played a critical role in the success of this business. Rhyming can enhance memorability, likeability and perceived truthfulness. However, it is not a panacea and should not be applied in every situation. In particular, “forced rhymes” can be silly or even painful, and can lead to negative feelings about your brand. But finding the right application of rhyming can be powerful! With apologies to The Beatles for borrowing a lyric from their song “All You Need Is Love” from The Magical Mystery Tour album, branding that uses “Love” or its symbols are scientifically proven to give persuasion a boost. Southwest Airlines has understood the power of love for quite a while (e.g., their stock exchange ticker symbol is LUV), and they recently launched a new advertising campaign that utilizes love in verbal and visual form to drive the “Southwest = Love” point home. Suburu is another company that leverages the power of Love in their marketing, including the tagline of “Love. It’s What Makes a Suburu, a Suburu.” What do they know that other brands don’t? The scientific evidence about the persuasive power of Love abounds. French behavioral psychologists Jacques Fischer-Lokou, Lubomir Lamy, and Nicolas Guéguen conducted a study of pedestrians walking alone on a shopping street1. During the survey the pedestrians were asked to remember either a meaningful episode of love or a meaningful piece of music in their lives. After they had completed the survey and had walked on for a few minutes, the pedestrians were approached by a person holding a map and asking for directions. Those individuals who had previously been cued to think about the concept of love were significantly more helpful in the amount of time they were willing to spend in the effort of helping another person. In another study, Guéguen and Lamay demonstrated that merely including the concept of love on charitable appeals led to a significant increase in donations2. Adding the words “DONATING = HELPING” to charity collection boxes increased donations by 14% compared to boxes that just contained the usual information about the appeal. However, adding the words “DONATING = LOVING” increased donations by 90%. Sometimes all you need is a visual symbol of love to make a difference. Southwest Airlines knows this as the “heart” symbol is omnipresent in their marketing materials. Guéguen conducted a study3 where food servers placed the bill, which had been folded in half and placed under a plate, on the table. The server put two candies on top of the plate and left the area. The researchers observed the tipping behavior of the diners. There were three different types of plates used in this study: round, square, and cardioid (heart-shaped). The diners whose bills arrived under a heart-shaped plate left tips that were 17% higher than those whose checks came under a round plate, and 15% higher than those whose checks came under a square plate. The conclusion from these studies is when people are exposed to words or signs that are synonymous with love it serves as a cue for the person to respond with behaviors that are associated with love. “Love begets love” is more than just an idiom. 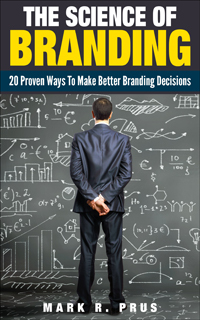 It is scientifically proven to be a universal truth that can be leveraged in branding and marketing. 1 Fischer-Lokou, J., Lamy, L., & Guéguen, N. (2009). Induced cognitions of love and helpfulness to lost persons. Social Behavior and Personality 37, 1213 – 1220. 2 Guéguen, N. & Lamy, L. (2011). The effect of the word “love” on compliance to a request for humanitarian aid: An evaluation in a field setting. Social Influence 6(4), 249-58, doi:10.1080/15534510.2011.627771. 3 Guéguen, N. (2013). Helping with all your heart: The effect of cardioid dishes on tipping behavior. Journal of Applied Social Psychology 43(8), 1745-9, doi:10.1111/jasp.12109. Recently I discovered a wonderful infographic on the different meanings of colors in various cultures. It got me thinking that people who are branding a product, service or company might be unintentionally offending some of their potential customers. In the use of colors for example, Westerners/Americans would consider grey to be a good logo color to show respect, but in Japan the color for respect would be white and in China it would be yellow. Grey in Japan would be more aligned with words like modesty or reliability. But sometimes the potential for offending your customer is less obvious. Most of the large companies I work with agree to conduct foreign language checks to ensure that the names have no problematic connotations in the major foreign languages. In one instance that prevented us from making a major mistake. It turns out one of the names we developed had an obscure slang reference in the Spanish language to a body part that…well, let’s just say it was not a good choice of name. Some of my smaller clients do not want to do foreign language checks because they are not planning to sell internationally. That is a mistake! Even if you have no plans to sell your product internationally, you need to beware of potential unintended consequences of your actions. Finally, if you want to check to see if a common word is being used as slang for something else in the English language you can always check the Urban Dictionary. However, be aware that, even though the Urban Dictionary is regulated by volunteer editors (similar to Wikipedia), some of the content of the Urban Dictionary is sexual in nature (for adults only! ).